The original motivation behind this investigation was an attempt to save my Statistics students a few precious seconds in their upcoming S1 module paper. 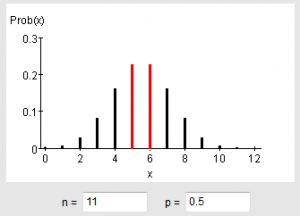 The mean or expectation of a Binomial Distribution is always very close to mode, (the value of X that has greatest probability). I want to know if you can use the mean to reliably predict the mode. 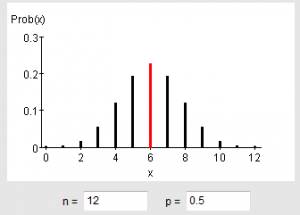 Binomial Distributions come up all over the place. A classic example would be where you try to score, say, a 5 with an ordinary dice. You perform n trials, and the probability of success on a particular go is 1/6. On each trial you’ll either succeed, i.e. score a 5 (the probability of which is 1/6) or you’ll fail, i.e. not score 5 (the probability of which is 5/6). X is simply the number of times you score 5 out of those n trials. 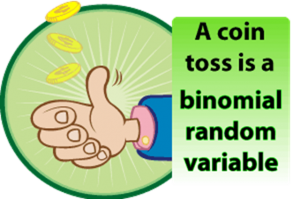 Binomial literally means ‘two numbers’: the probability of success and the probability of failure; and the two numbers must add up to 1. But we can be very general. In the following example we are not even given the context of the experiment; we’re just given n which is the number of trials, and p which is the probability of success on each separate trial. (i) The expected number of successes (the mean). (ii) The most likely number of successes (the mode). Part (i) is straightforward. Just use the formula np. So the mode is 8 successes. Is there a quicker way that doesn’t involve using the formula nCrpr(1-p)n-r ? In this example, the expectation, np, rounded to the nearest integer, is 8. Is it a coincidence that this value is also the most likely number of successes? 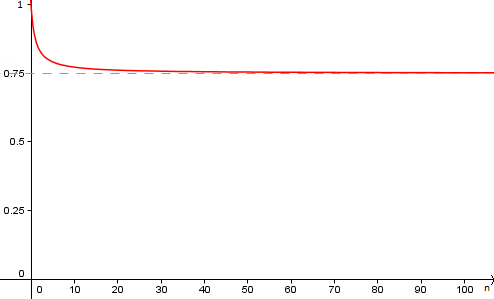 The value of p changes only slightly from 0.44 to 0.45, but the most likely value of X has now jumped from X=3 to X=4. So there must be a value of p between 0.44 and 0.45 where P(X=3) and P(X=4) are exactly equal. This can be derived in either direction, so: if there exists a positive integer r ≤n such that p=r/(n+1), then P(X=r) = P(X=r-1). But, also, there is a tipping point at which np stops being rounded up and starts being rounded down: this is halfway between the two integers, at np = r-½. Divide both sides of this equation by n, to give p=(r-½)/n. 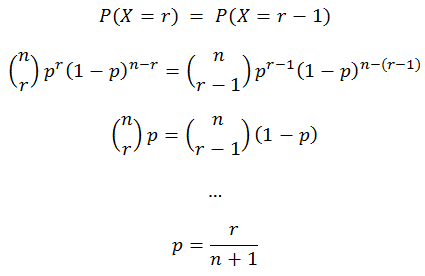 Now we have two expressions for p.
If the value of p can fall between r/(n+1) and (r-½)/n then the hypothesis does not hold, i.e. we cannot confidently round the expectation to the nearest integer to calculate the mode. 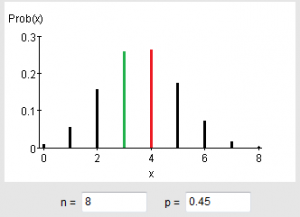 If p takes a value between these figures then the hypothesis does not hold. Given how close these figures are to each other, this explains why a counterexample seemed so elusive. These compound inequalities provide only small windows into which p must fall in order to negate the hypothesis. We will now add up the sizes of these small windows to determine the likelihood that the hypothesis does not hold. Effectively we’re working out: if you blindly round the expectation to the nearest integer, what’s the probability you get the correct (or incorrect) mode? Since the binomial problem could come from any source and in any context, it seems reasonable to assume a uniform distribution for p between 0 and 1. Consider the size of these small windows – that size is the difference between the two expressions we have for p. We can sum over this expression for all values of r from 1 to n. This gives the probability that, for a randomly chosen value of p, the hypothesis does not hold. For large values of n, this is approximately equal to ¼. So, for a randomly chosen probability of success from a single trial, the probability that the hypothesis holds is at least ¾. That means you’re likely but far from certain to get it right. It’s probably not worth just guessing. Shame! The graph below shows how the probability that the hypothesis holds varies with increasing n. See how it tends to ¾ from above. The recommendation by the textbooks, to separately calculate the probabilities that X takes each of the values either side of np, then choosing the larger, is the best approach to finding the mode. But there is at least a ¾ chance that it will be the integer value closest to np, so if (and only if) you’re really short of time in an exam, guess!